I took a refreshing few weeks off from the powerful lure of the Internet and now I’m just a wee bit overwhelmed with trying to catch up with work, seeing what’s happened in blogland, and trying to pack up my house. 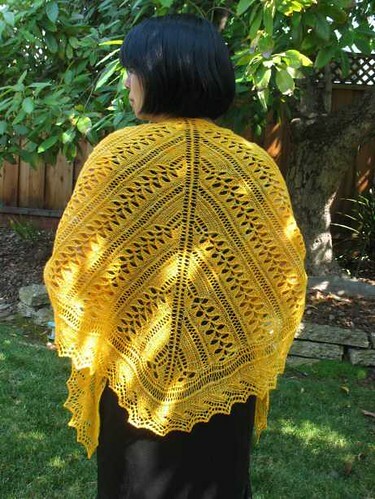 I battled food poisoning of some sort (probably brought on by eating too much kebab at a really great Afghan restaurant my parents took me to), finished the Loquat Shawl with one day to go, and tried to model it during a crazy heat wave–my dad said it was 107 degrees where they live. My camera didn’t like the light and the pictures didn’t come out that great, but they’ll have to do. I fulfilled my bridesmaidly obligations–fetched and carried, walked down the aisle, did my toast, and toted a Maid of Honor Emergency Kit around with me everywhere. A word of advice to any other first-time bridesmaids–everybody wanted safety pins for one thing or another; they will be the most useful thing in your purse. The groom needed one for his boutonniere, one of the wedding guests needed one because her dress started to come apart during the reception, etc. I wish I’d had bug spray, too, because the mosquitoes were out in force, but this is not something that will be applicable to most other weddings. The wedding was beautiful, a 70-person affair in a little wooden chapel by a mountain lake. 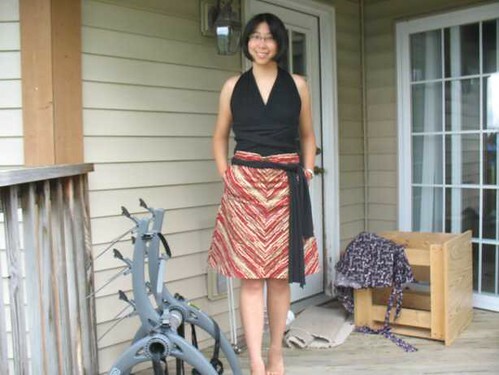 It was small, short, informal, and intimate, in stark contrast to the grand party of multiple ceremonies and costume changes at the wedding I went to the previous weekend. The cabin where we were staying didn’t have electricity or potable water and was only accessible by boat, so there were some good times after the rehearsal dinner when the boat motor broke down and the 8 people in the boat took turns rowing across the lake by moonlight (we were saved after 45 minutes by a neighbor who came by and gave us a tow). Thank God it was informal, and that my hair is pretty low-maintenance, because there was no real opportunity to iron my clothes or blow-dry my hair before the ceremony. 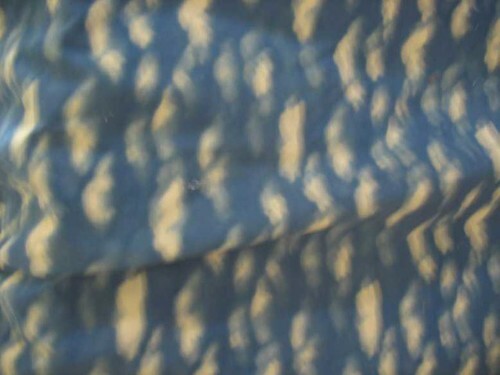 I slept in a sleeping bag in the cabin attic with the mice, and ran down the granite slope to swim in the clear, cold lake the morning of the wedding. It was lots of fun–how all weddings should be. So, aside from that, I saw family and friends (between the wedding and family visits, I somehow ran out of time and didn’t get to meet up with everyone I had hoped to see) and got to go play in the Bay Area a little bit. The best part was when my parents and I went up to Point Reyes and, while we were walking on the beach, saw a humpback whale frolicking in the water! It was out there for a long time, so we saw its tail and back and face and lots of puffs from its blowhole. Plus we saw pelicans, spotted fawns eating grass in the marsh, turkey vultures, egrets, various little birds, and what was possibly a seal turning around in the waves. After that initial terrible heat wave, the Bay Area spent the rest of my visit living up to Mark Twain’s adage “The coldest winter I ever spent was a summer in San Francisco”–I was freezing most of the rest of the time I was there, as the temperature hovered around 60 or below, with chill winds whipping in from off the Bay. 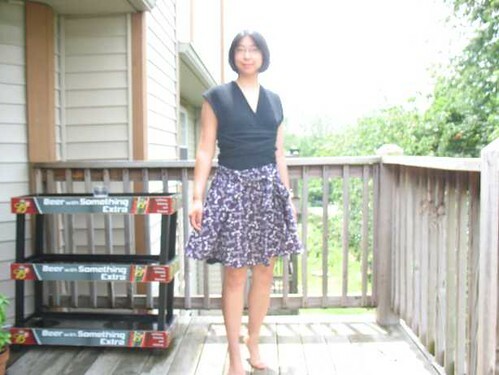 But I did some of my favorite things–I saw friends and family, went to Thai Temple, Chez Panisse, the Edible Schoolyard, Berkeley Bowl, the Ashby Flea Market, Stonemountain and Daughter, and a pub quiz at the Missouri Lounge. I finished a Branching Out scarf for Molly in the llama yarn I got from Yellow Wood Llamas, and we spent a craft-shopping day at Lacis, General Bead and Artfibers, topped off with yummy crepes from Ti Couz. (This was the only day I actually made it into the city the whole time I was back home.) I did stop off at the new yarn shop in my old neighborhood, K2tog, but only for a few minutes while I waited for Molly (sorry, Kristen, I was going to look you up but didn’t have time!). I got fabulous but expensive Japanese stitch dictionaries (one knit, one crochet) at Lacis, some earring supplies and vintage blue glass buttons at General Bead, and some more Kyoto (the glowing red color) and Golden Chai (a silvery gold color) and yarntastings at Artfibers. I’m looking forward to coming back to Thursday knit night this week, and I hope to have some time to put up pictures of the llama scarf and my Built by Wendy FO’s–the dress I made from blue striped shirting is very uniform-like and I’m not sure how to fix it, but perhaps I’ll have some adornment ideas soon. 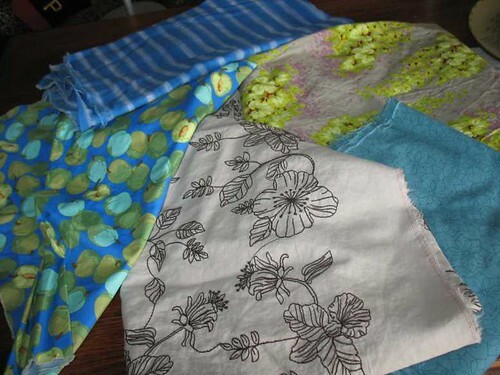 I may have to consider the blue version my muslin, and make it again with a cuter fabric, like Mari’s. It came out pretty well overall, though–i.e. it fits and I didn’t make any really horrible mistakes! 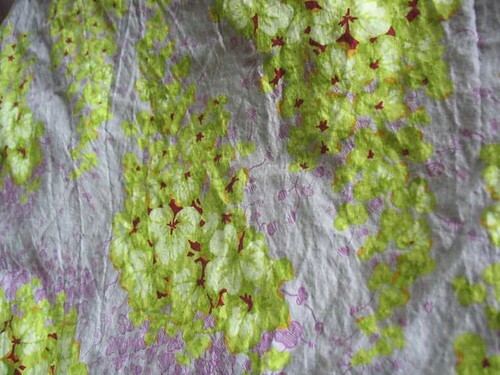 And it has pockets. 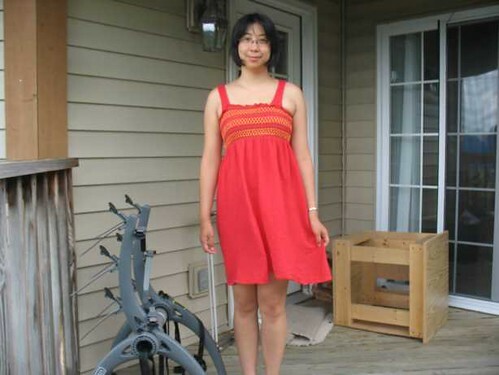 I strongly approve of pockets in a dress. 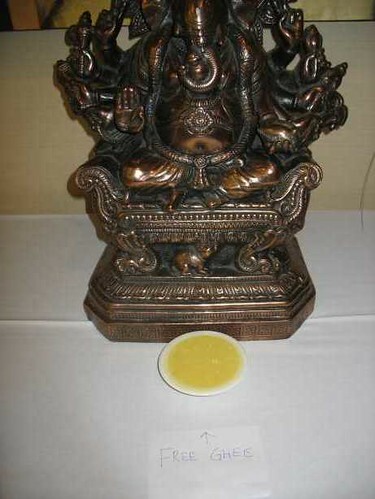 Gee, your ghee looks terrific! 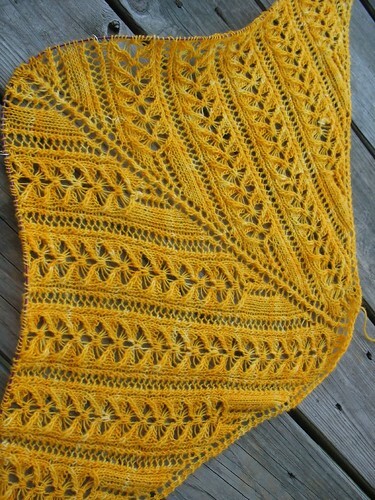 I’m safely in California now, and at long last a few rows into the edging for the wedding shawl. 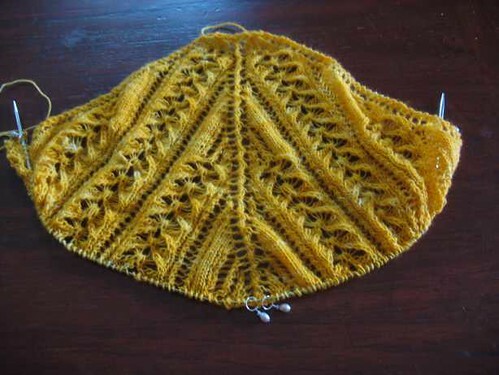 I decided on the Wave Edging with a bit of faggoting between it and the body of the shawl. This last weekend, I made it through Rahul’s cousin’s wedding, an intense, three-day party, full of dancing, drinking, and delicious food, for hundreds of friends and relatives. Off on my vacation now! Leaving for Toledo today, California on Sunday. I may or may not be posting while I’m gone over the next 2 1/2 weeks or so. 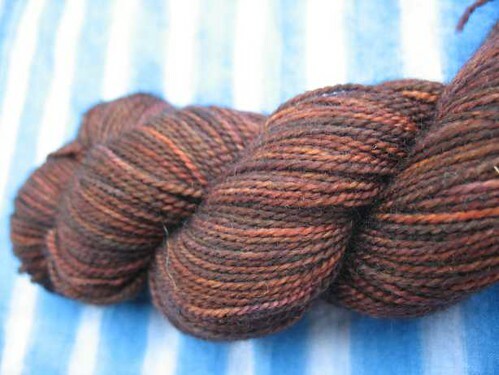 Any suggestions for good yarn shops to visit? I have no idea if I will actually have any time for such things–I’m not going to be in the Bay Area for a decent chunk of that time due to the wedding, and there are plenty of other things I want to do while I am in the Bay Area, but just in case. 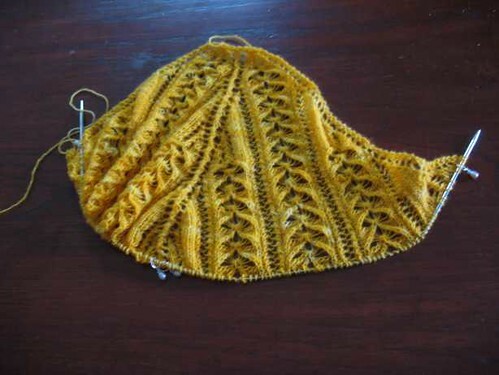 I know there’s a new one in Albany called k2tog, and I am always interested in visits to Artfibers, Imagiknit, Article Pract, Stonemountain and Daughter, Lacis, and Stash Yarns, but I’ve been to all of those except k2tog already. 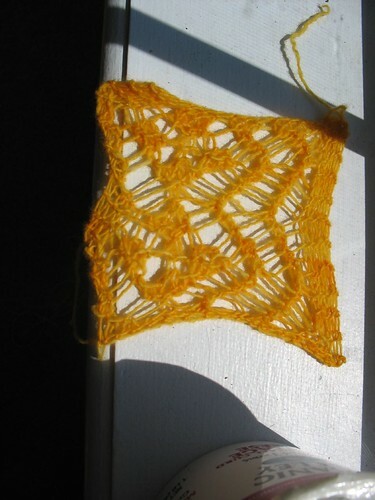 I’m having some doubt on the edging pattern. 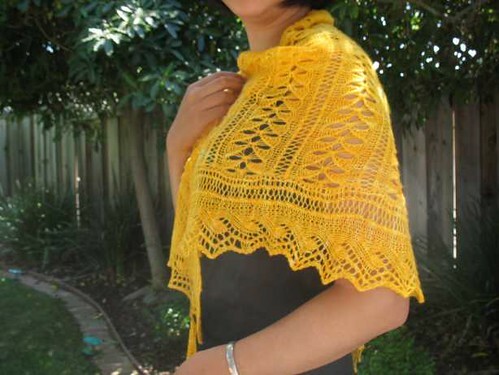 I was thinking of using this one (Classic Bead Edging from Barbara Walker), with that top garter strip changed to faggoting to match the pattern in the main part of the shawl, but maybe it looks too bumpy, too open/uneven in contrast to the stockinette triangles in the Honeybee lace. 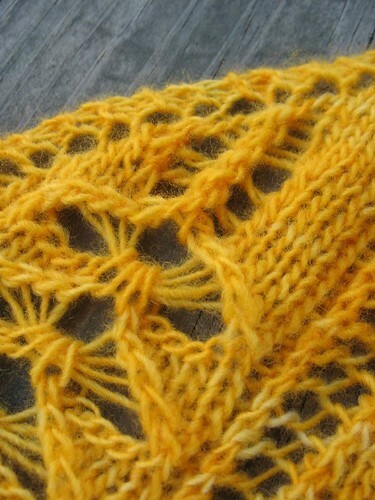 The swatch below has been blocked, by the way. What do you think? 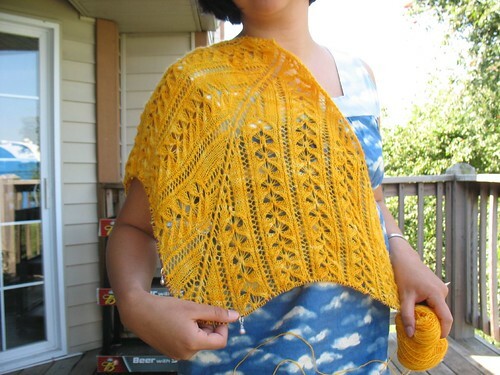 The Wave Edging used in the Print o’ the Wave stole might be nice–it’s one of my favorite edgings of all–but I was worrying that it might be too small-scale to work with this shawl and might not be stretchy enough to bind off the faggoting stitches, which are very wide. 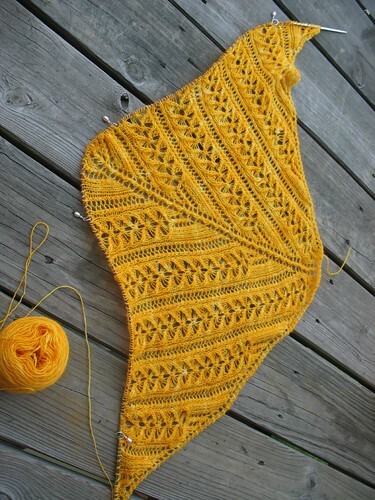 I’ll make a swatch tonight if I have time… otherwise, BW vol.2 is coming with me on my trip to Toledo. 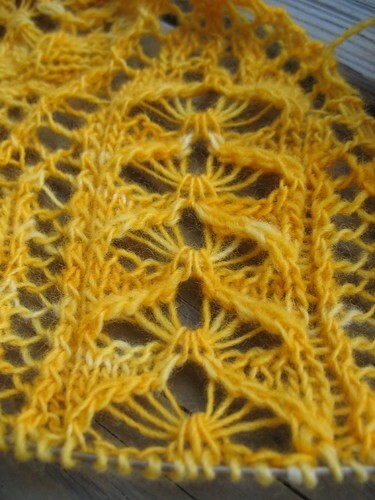 Here are details of the mini-cables leading into the honeybee lace at the 4 increase points on the shawl. 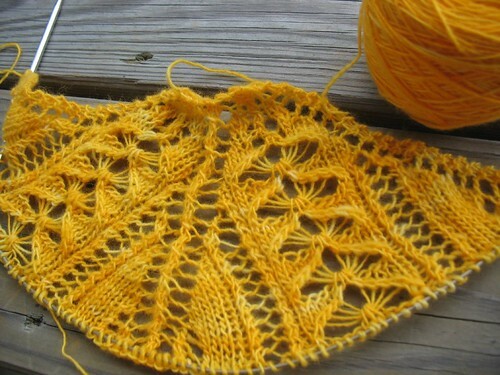 They twist in opposite directions on the two sides of the shawl. 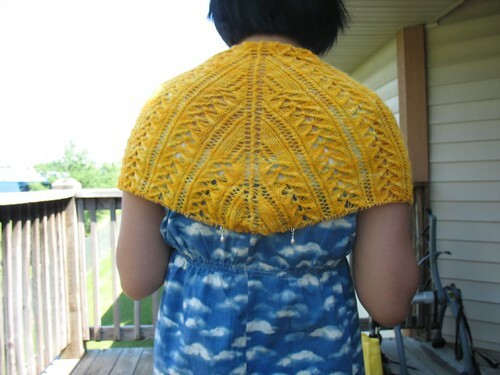 Here’s a little sneak peek at the current progress of the YELLOW! 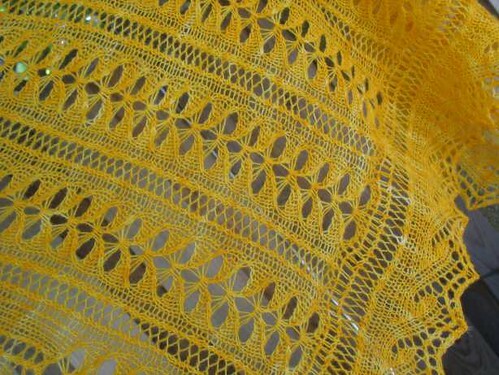 wedding shawl I’m making for my best friend. I could use some encouragement that yes, it looks pretty and is worth continuing on with… it’s a bit of a beast to work, as there is lace patterning on every row and due to the little minicable-and-lace increase pattern leading into each repeat of the honeybee-and-faggoting pattern, the chart is 46 rows long. Still, each individual bit of it is pretty intuitive, as long as I don’t get mixed up about which part of the pattern I’m working. 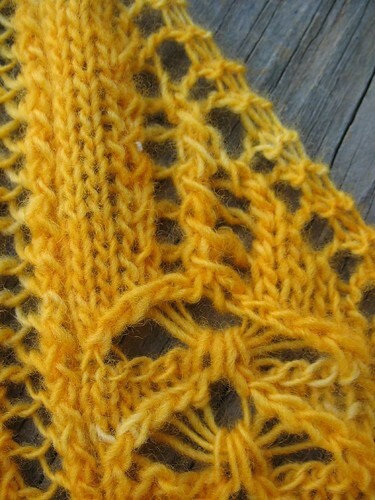 It’s a top-down triangle and I’ll finish it with a sideways knitted-on edging. 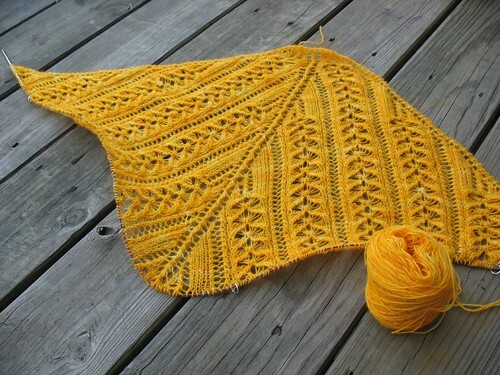 I’m really loving the color and the yarn.